Established in 1973, D&D Finer Foods is a family owned and operated specialty foods grocery store. For over forty years we have dedicated our store to bringing fresh produce and gourmet foods to our patrons. With the help of local vendors we are able to provide customers with hormone and steroid free meat and poultry, available at our meat counter. Local businesses such as Pipeworks, 3 Floyds, Sketchbook, Temperance Brewing co., and many more contribute to our wide selection of craft beers. Although we make a grand effort to incorporate local vendors, we go above and beyond to hand pick our merchandise in order to satisfy the needs of our customers. From our Greek inspired section, to our made-to-order gourmet and deli sandwiches, we aim to provide the neighborhood with a variety of goods in one convenient location. 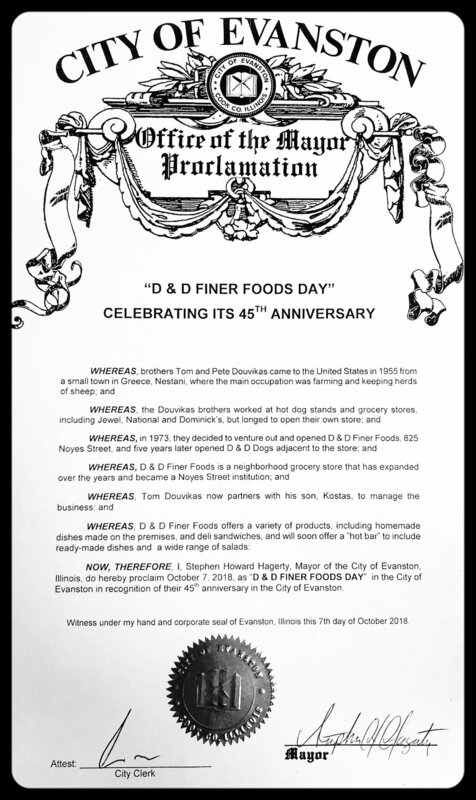 On October 7th, 2018 we celebrated our 45th anniversary, a day which was officially declared “D&D Finer Foods Day”. We are grateful to our Evanston Community and Mayor Hagerty with presenting us with such and honor.